In my usual attempt to clear out the docket before the end of the year, here are some quick reviews: Vince Camuto, Miller Harris La Fumée, BCBG Max Azria. Vince Camuto's eponymous debut fragrance was made by Parlux, the same folks who've brought you fragrances by Paris Hilton and Jessica Simpson — but before any of you anti-celebrity-fragrance perfumistas turn your noses up (pardon the pun), they also did the lovely Natori fragrance. The Vince Camuto is a floral chypre, in the modern (yes, it's really an oriental) style, with a fruity top and a lightly spicy, sweet floral heart over a subtle leather and clean patchouli dry down. It turns drier and almost-smoky near the end. It does not, as it turns out, rival Natori (it's in Macy's instead of Saks, and in this case, it all fits) but it's nicely done. If you're looking for a sweet-ish, middle-weight oriental for winter and don't want to cough up the dough for Natori, it's worth a shot. If it's close but no cigar, you might also check out Jessica Simpson's Fancy Nights — they're vaguely related (and were made by the same perfumer, Steve DeMercado). Vince Camuto by Vince Camuto features notes of rum, osmanthus, rose, leather, night blooming jasmine, vanilla absolute, patchouli, amber and skin musk. It is available in 30 (but not in the US), 50 and 100 ml Eau de Parfum. 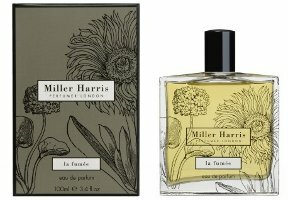 Miller Harris La Fumée is available in 100 ml Eau de Parfum; notes feature cistus, geranium, cardamom, coriander, cumin, elemi, papyrus, birch tar, incense, sandalwood, cedar and amber. I can only assume BCBG's attempt to do fragrance in-house (BCBG Max Azria Within) didn't work out so well because they signed a licensing agreement with New Wave shortly after. The resulting eponymous fragrance is classified as a "soft floral", and it is, in a youthful pink 'n fruity 'n clean style: lots of fizzy sheer red fruits in the opening, sheer flowers in the heart, a mostly bland and pale base smoothed out with a touch of powdery iris. It's innocuous enough, if not particularly original, and the same goes for the bottle, which is yet another variation on Marc Jacobs Lola. BCBG Max Azria was developed by perfumer Stephen Nilsen; notes include strawberry, black cherry, kir royale, jasmine, muguet, rose, violet, musk, orris and sandalwood. It can be found in 50 and 100 ml Eau de Parfum and in matching body products. 1. Which is not the same as the light, rather basic Incense that was part of the later (2007) Matthew Williamson Collection. The Miller Harris version was likewise called "Matthew Williamson Incense", and it originally came out in 2002. If I remember correctly, it started disappearing from the planet around 2005 or 2006. Thanks to our Empress of Enabling, I have a sample of the Miller Harris in my sample pile awaiting my nose. Now you’ve pushed me to do it. Thanks for the reviews, Robin. Let me know what you think. I thought it was really good — there are just already so many really good dry spicy smoky incense scents. Exactly! My favorites being Bois d’Armenie and Incense Pure. This also reminded me of one of the Olivier Durbanos, and maybe a bit of Donna Karan Chaos. That reminds me, did you mention you’d tried the Olivier Durbano Citrine? Not that the Miller Harris sounds similar to that particular one, but I’m curious to know what you thought of it. I’m still undecided but liked it quite a lot the first couple of times I wore it. That’s the one with mimosa, right? I tried it very quickly with 5 other things, didn’t adore it, sent it off to Kevin who wanted the sample (he loves mimosa, I don’t). So can’t really comment but hope he will review it! Wow, the Lola ripoff bottle reigned supreme this year (too bad I hate it). Is there a running tally? We should really start keeping one. All that’s coming to mind right now is this, Biebers, and Lovestruck, but I know there’s more. I didn’t keep one. This one isn’t nearly so blatant as Justin Bieber’s. Yes, definitely not. I find that one to be a ripoff in many ways; it smells nearly identical to Viva La Juicy to me. So many things smell like Viva La Juicy! It’s been copied as much as Lola. Miller Harris kindly sent me samples of La Fumée and La Pluie and I found both quite pleasant but I would agree that La Fumée is not wildly original. Must say that I don’t find it at all smoky and not hugely churchy either. To my nose it’s more crisp with a touch of sandalwood in the base and very wearable. I’m afraid I didn’t care for either of of the new Miller Harrises, although they are so well made. 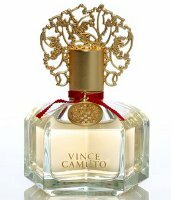 I’m curious about that Vince Camuto, though. Hopefully I’ll get to sample some soon. Not sure who has it besides Macy’s, but they’ve definitely got it. I’m kind of glad to hear that — assumed that in person it would be flimsy plastic (like the Betsey Johnson a couple years ago). Yeah, not flimsy at all. Just be carful with it. It could easily break glass or chip ceramic if you drop it in your bathroom! Couldn’t agree more on the Miller Harris. It smells as if good ingredients were used but they have all, in some permutation or other, turned up elsewhere at least 100 times. This year. And that’s only a slight exaggeration. It’s a shame. If it had come out 3-4 years ago, I’d have probably had to buy it. I sniffed BCBG Max Azria today and I really like it! I even contemplated buying it ! it’s sweet more than anything. like super sweet! I think most people would find it too sweet.